Runs for Cookies: Dried cherries! I had six miles easy on the schedule today, but Jerry was working this morning, so I couldn't leave the kids to go for a run. It was so nice outside that I didn't want to run on the treadmill, so I decided to just wait until after Eli's friend went home, and take my kids to my parents' house while I fit in my outdoor run. For breakfast this morning, I was really craving something with the dried cherries I bought at Sam's Club yesterday. I adore dried cherries, but they're a binge food for me, so I had to be careful about even buying them. But they're okay in my trusty Kitchen Safe! I ended up making a really tasty combination: an English muffin topped with Coconut Almond Butter and chopped dried cherries. That was only 1 PP-worth of cherries. They go a long way when they're chopped up! 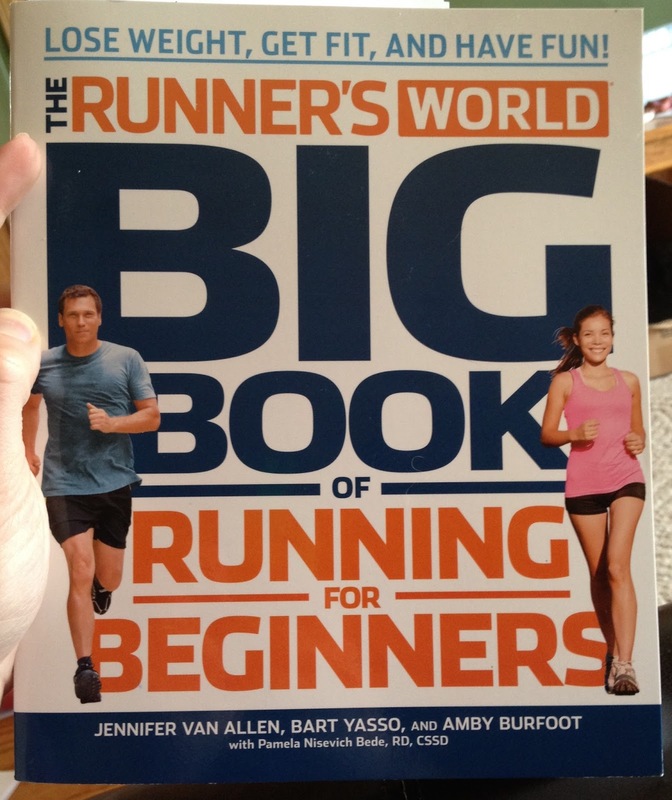 I spent most of the morning reading a book that Runner's World sent me to review: The Runner's World Big Book of Running for Beginners. Now, I'm not exactly a beginner, but a lot of people ask me for recommendations about books on running. The ones I read are usually about a particular training method (like Hansons Marathon Method, for example), so I never have suggestions for a book about the basics. Most of what I learned about running during the first year I was a beginner came from Runner's World magazine--so I was curious to see what this book was all about. I've now found the perfect book to recommend! This book is like everything I've ever learned about running all condensed into one book--and it's easy to read, which is even better. I especially liked the "Running Etiquette 101", which has a list of questions and answers about things that people email me to ask about all the time; things like: passing on the right or the left, wearing a chip timing device, where to put your race bib, which direction to run on a track, etc. They're questions that you don't really think about until you're in that situation and totally unsure. It has training strategies for people who want to 1) start walking, 2) start running, 3) run nonstop, 4) run faster, and 5) run longer. There is advice on nutrition and fueling for runs; proper running form; advice on injury prevention; and what I found most interesting, real life stories from everyday people on "How Running Changed My Life". Overall, this book is pretty much everything a beginner would want to know about running. The only downside is that it truly is very basic information--if you've been running for a few years, or do a lot of reading about it, then you probably know most of the info. But if you're hoping to start running, or you have only recently gotten started, it's a great read! So I finally got to head out for my run at around 3:00 this afternoon. I hate running in the afternoons! And I definitely overdressed. I was really cold at home, so I was wearing long pants and a long-sleeved top, which is what I wore on the run--and it was 64 degrees outside! I should have been wearing my capris and a tank top. I drove the kids to my parents' house, and then I decided to just run from their house around the neighborhoods for six miles. Instantly, I felt too hot, but my plan was to run slowly, at the recommended "easy run" pace of 10:15-11:00/mi, so I hoped the heat wouldn't be too bad. I stopped at each mile mark to take a photo from my point of view. Nothing very interesting on this route, though. The rain felt SO good! I haven't run in the rain in a long time, and it really felt heavenly. Anyway, I wasn't feeling very good for most of this run, and I think it was because I had eaten lunch at 2:00. I'm not used to running with a big meal in my stomach, and I'd eaten cheese grits with Brussels sprouts and an egg on top. 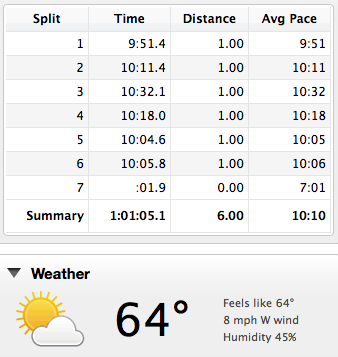 My stomach just wasn't feeling that great, so it was nice to be able to go at a slower pace. I love those fiber one lemon bars, but they don't love me! Maybe that was it? I love brussel sprouts so much. I am so glad that the temperature is finally a normal range and I can run outside. It's my favorite! I love dried fruits! Dried mango is dangerous for me though. Once the pack is opened, it's all over. I have to be really careful about it. Looks like a lovely day for a run to me. We were graced with a lot of liquid sunshine here in Florida, so my run was pretty wet. Something about running in the rain makes me feel really dedicated! love that you have a review for the book. I got an email yesterday with it in it, but I couldn't decide. It's kinda pricey, but now I think I'll go read the email again. Looks like a pretty route! Flat too! Which English muffins do you eat for 2 points? 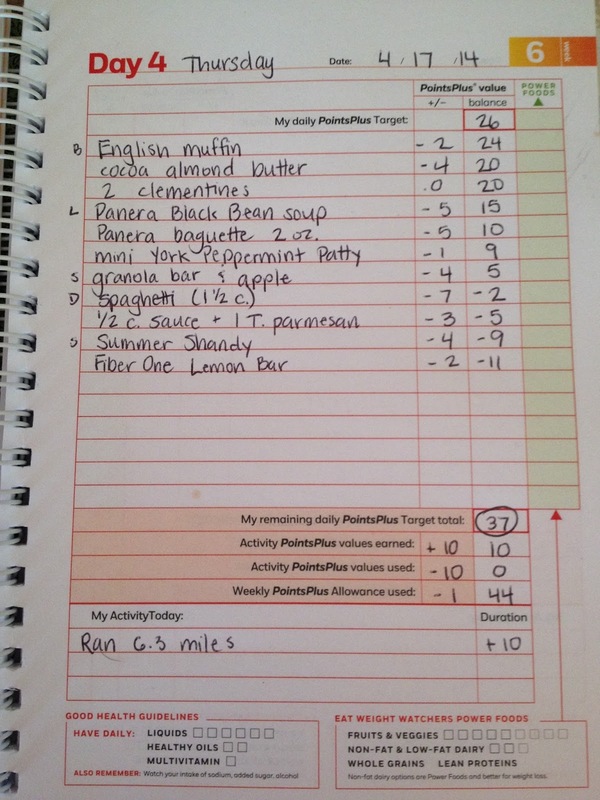 I am always looking to eat the same foods for fewer points.